Consider a small spiracle body is attached at the lower end of string whose upper end is fixed when a small spiracle body is moved in horizontal circular the string attached to the body swipe over the surface of cone the whole system is called conical pendulum. Consider a small spiracle body of mass m is moving in a horizontal surface with angular velocity ω with center at o. at any moment the body at ‘a’ the string attached to body moves an angle θ with vertical the force are acting on the body are as shown in figure. 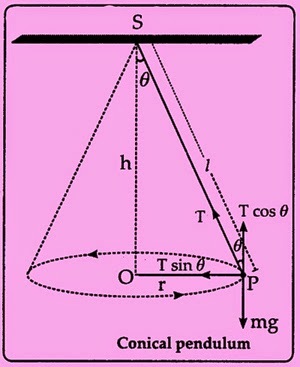 T sin θ is acting towards the center of the circular path. This component will provide circular path.This component will provide the required centripetal force for circular motion.